Deputy director of IPM RAS, Head of Magnetic nanostructures department, Leading research associate, Dr. Sci. 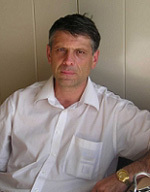 Born on 07.09.1957, Nizhniy Novgorod, Married. Physics of metal nanostructures, physical principles of recording, storing and processing information. Akhsakhalyan A. D., A. A. Fraerman, Platonov Yu. Ya., Polushkin N. I., Salashchenko N. N., Diffusion in multilayer structures of superthin films the metal-carbon. // Thin Solid Films 207 p.19−23 (1992). A. A. Fraerman, Deformation mechanism of the interaction of point defects in a random elastic medium. // Physica A 241 (1−2) p.102−104 (1997). A. A. Fraerman, Mel’nikov A. S., I. M. Nefedov, I. A. Shereshevskii, Shpiro A. V., Nonlinear relaxation dynamics in decomposing alloys: One-dimensional Cahn-Hilliard model. // Phys. Rev. B 55 (10) p.6316−6323 (1997). S. A. Gusev, N. A. Korotkova, Rozenstein D. B., A. A. Fraerman, Ferromagnetic filaments it in porous Si matrix. // J. Appl. «Phys. 76 (10) p.6671−6672 (1994). A. A. Fraerman, Sapozhnikov M. V., Metastable and nonuniform states in 2D orthorombic dipole system. // J. Magn. and Magn. Mater. 192 p.191−200 (1999). A. A. Fraerman, S. A. Gusev, Mazo L. A. et al, Rectangular lattices of permalloy nanoparticles. // Phys. B Rev., 65, 064424, (2002). A. A. Fraerman, Sapozhnikov M. V., Hysteresis model with dipole interaction: Devil’s staircase like shape of the magnetization curve. // Phys. B Rev., 65, 184433, (2002). Aladyshkin A. Y., A. A. Fraerman, S. A. Gusev, Klimov A. y., Nozdrin Y. N. Pakhomov, G. L., Rogov V. V., Vdovichev S. N., the Influence of ferromagnetic nanoparticles on the critical current of Josephson junction. // Journal of Magnetism and Magnetic Materials, 258−259, p.406 (2003). Aladyshkin A. Y., A. I. Buzdin, A. A. Fraerman et al., Domain — wall superconductivity in hybrid superconductor — ferromagnet structures. // Phys. B Rev., 68, 184508 (2003).